Columbia, MD – July 18, 2016 – SolarWindow Technologies, Inc. (OTCQB: WNDW), the leading developer of transparent electricity-generating coatings for glass windows on tall towers and skyscrapers, today issued its mid-year 2016 update. 2016 marks our advancement from scientific research to the commercial development of our SolarWindow™ products. Our scientists, engineers, management, and loyal stockholder supporters remain entirely devoted to this mission, even overcoming external factors such as stock market fluctuations and global political and economic events. Having just completed a $4.3 million financing, I believe this is an appropriate time to update shareholders about the progress made by our team over the last two quarters. SolarWindow™ has the potential to reduce our dependency on fossil fuels, thereby transforming the renewable energy industry. This is a bold declaration to be sure, but imagine the possibilities of successfully developing an electricity-generating window capable of paying for itself in a single year. Mindful of managing our development and operating costs to meet our commercialization objectives, our recently completed $4.3 million financing will largely fund our expanded Cooperative Research and Development Agreement (CRADA) with the U.S. Department of Energy’s National Renewable Energy Laboratory. We commemorated the signing of our expanded CRADA with a video that shows behind the scenes footage of state-of-the-art manufacturing and testing equipment used to engineer SolarWindow™: https://www.solarwindow.com/2016/03/solarwindow-in-the-lab/. We’re also working towards formalizing strategic relationships with the glass, energy and chemical industries. Given that sunlight striking the Earth’s surface in just one hour delivers enough energy to power the World for an entire year, the prospect of SolarWindow™ products generating electricity on skyscrapers could be one of the greatest inventions of this century. Again, a bold statement, but that’s exactly what we are attempting to do. What started out as a concept in 2009 now generates electricity on glass and even flexible plastics. SolarWindow™ produces 50 times greater electrical energy than rooftop panels, has an independently validated one-year financial payback and can harness energy from shaded, low, and indoor light, when modeled for a 50-story building. Our transparent window coating technology is so revolutionary that it has been presented before members of the U.S. Congress and received noteworthy recognition in many well-known publications worldwide. 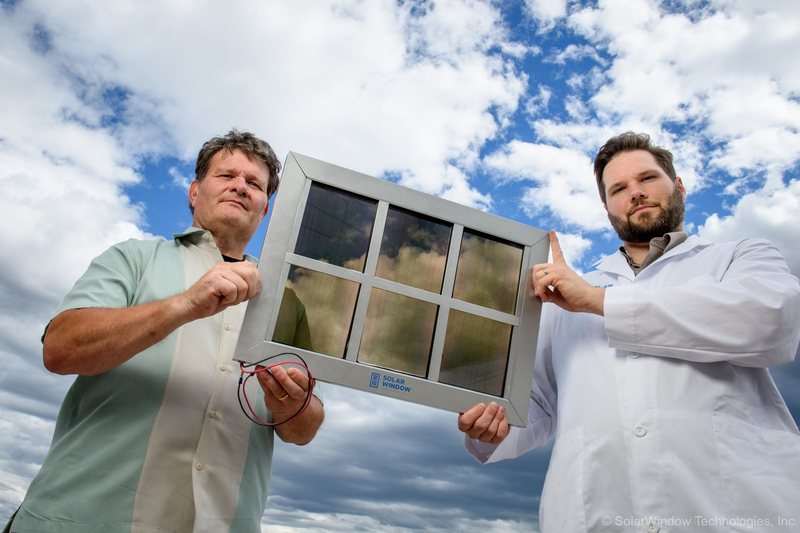 SolarWindow™ may be one of the most disruptive renewable energy innovations. Our SolarWindow™, when installed on the many acres of glass typically found on tall towers, has the potential to turn entire buildings into vertical power generators, reducing electricity costs by up to 50% per year. Recently, Voice of America, which reaches 187 million people each week, reported that the U.S. has over 5.6 million commercial buildings with more than 86 billion square feet of windows. If only a fraction of the glass on these buildings could collect power from the sun using our SolarWindow™, it would substantially lower the need for fossil fuel-based electricity generation, hence my personal excitement and commitment to developing our technology. Our mission is to bring SolarWindow™ to market as quickly as possible. With the steadfast support of our shareholders we will have our ‘Kitty Hawk’ moment.